Why Would Anyone Want to Work Out Until They Puke? As intense exercise programs like CrossFit and P90X gain popularity, a look at the psychology of pushing your limits—and when that can be a bad idea. Pukie the Clown is a controversial figure. As you might infer, he is a puking clown. Or rather, a drawing of one, who serves as a mascot for the notoriously intense fitness program, CrossFit. Though it’s impossible to measure precisely how often people vomit from CrossFit’s workouts of the day (WODs), there are a few threads on the CrossFit forum—“What exercise makes you puke every time?”; “Exercise-induced puking: What induces it?”; “Is vomiting really okay?”—that suggest it is not unheard of. And, you know, the choice of a puking clown as mascot is a hint. CrossFit is not the only mega-hard workout that’s become popular in recent years. For fitness video series P90X and Insanity, as well as obstacle course races like Tough Mudder (where obstacles sometimes involve fire or live electrical wires), being difficult is a selling point. “Tough times don’t last, tough people do!... Pain is temporary,” reads a t-shirt prominently displayed on the Tough Mudder website. Vomit or no vomit, the experience will be unpleasant, but you will be better for it. This is the promise of extreme exercise. But to determine why people are attracted to exercise programs where vomiting or being shocked by a live wire seem to be at least somewhat more likely than in day-to-day life, we must first ask: Why exercise at all? The reasons people exercise can’t be boiled down to dichotomies: Either they like working out or they don’t, they’re motivated or they’re not. The truth is that motivation is complex, and some reasons for working out are healthier than others. Philip Wilson, an associate professor in the department of kinesiology at Brock University in Canada, has been studying exercise motivation for the past 10 years. He says that while intrinsic motivation—exercising because you think it’s fun, and you actively want to do it—is the ideal for creating a long-term habit, ultimately exercise can’t make you love it if you don’t. In the absence of a genuine love for running on the elliptical, exercising because you know it’s good for you, or because you want to be the type of person who exercises, are better motivations (in terms of feeling good and sticking with it) than exercising because you’d feel bad about yourself if you didn’t, or because you think someone else wants you to. “These CrossFit programs do not draw couch potatoes,” Wilson says. That certainly seems to be the case for Darsh. But Wilson says it’s also possible that some of the more troubling motivations are behind the trend—that people are seeking a reward (such as losing weight), “or they have a very fragile sense of self-worth.” Unhealthy motives are more likely, according to Wilson, when people take extreme exercise to, well, its extreme—pushing through intense pain, or continuing to work out through nausea. Nausea is a warning sign, says Anthony Wall, director of professional education at the American Council on Exercise. There are a few things that can cause nausea during a workout. One is a full stomach, which isn’t much of a cause for worry. (Just maybe next time, do your daily P90X video before entering a hot dog eating contest, not after.) Another is dehydration, when an imbalance of the body’s electrolytes can cause vomiting. The risk for vomiting from extreme exercise, specifically, comes from working so intensely that the body can’t get enough oxygen to fuel its muscles, leading to a build-up of the waste product lactate. Nausea can also, in rarer cases, be a symptom of rhabdomyolysis—in which damaged muscles break down, and their protein enters the bloodstream. 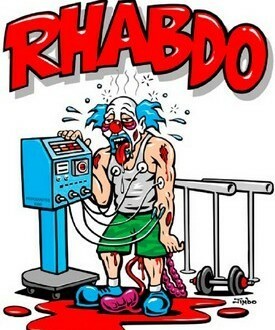 There have been a few cases of people coming down with the condition after a CrossFit workout, and “Uncle Rhabdo,” another cartoon clown, even more alarming than Pukie, illustrates the danger. There is some evidence that people are drawn to hard work when life gets overwhelming. A recent study published in the Journal of Consumer Research found that people prefer products that require them to work hard when they feel low in control. In the study, feeling out of control with respect to their health especially drew people to exercise, but lead study author Keisha Cutright says feeling generally out of control could still make intense workouts seem appealing. And super-athletic fitness nuts like the ones often drawn to CrossFit or Tough Mudder probably do feel like exercise is something they can control, that they understand and exceed at. For the record, the American Council on Exercise does not advocate working out so hard that you feel nauseous.